Cranberry beds as a general rule in Wisconsin, are vine to vine 150 feet wide and as long as desired but usually not exceeding 1200 to 1400 feet long. This is primarily due to an easier faster flooding process. Most of the new marshes that have been built in the past ten years or so are referred to as upland marshes. Upland marshes are built in higher generally sandier soil and not peat soil. Most upland marshes are not flooded by gravity or gravity is only available to be used in one direction for water flow. That being either flooding into the beds are draining the water back out and putting it back in the individual marshes pond. 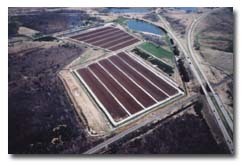 Upland marsh Cranberries are grown entirely in sand and as such requires the installation of an irrigation system. Cranberries grow just like any other crop and are not in water other than during harvest or winter flood. Irrigation is also used in protecting fruit and budding vines from freezing in the spring and fall. Availability of water and lots of it are a must especially on an upland cranberry marsh. Peat beds are generally much less vulnerable to drying out because of the organic content which is able to hold moisture unlike sand. 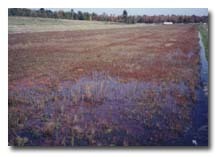 Most upland cranberry marshes are required to be irrigated on a daily basis. On the marsh pictured below approximately 30 to 40 million gallons of water are required to put on one flood. This is only done in the spring. The flooding is sometimes done in the spring for freezing protection. The flooding of the cranberry bedds is also done in the fall for the harvest of the berries. The cranberry beds are also flooded again when there are temperatures cold enough for making ice for sanding or general protection from severe cold. This water is recycled and used over and over again but it has to always be available. The sand in the cranberry beds allows spoon-feeding of desired nutrients to feed the crop. Cranberries are known to flourish better in a lower P.H. soil. 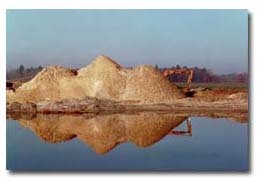 Some marshes tend to have to add correctives to the sand to maintain a lower P.H., such as sulfur. In many of the newer beds the irrigation is buried under the sand and the sprinklers can be taken in and out as desired for winter flooding and harvest. Cranberries and the non-dormant pre-harvested plants must be maintained at a temperature above 32 degrees for the most part. There are exceptions but very few. Most cranberry marshes are equipped with automatic sensing devices, which some are computerized. The sensor tells the unit that the temperature is at a predetermined warning point and sends off an alarm to the person in charge of starting the sprinkler system. As long as the vines and fruit are kept sprinkled from 32 degrees or lower until very cold temperatures are present, the fruit does not freeze. The plants will cake up with ice, which at times gets very thick by morning. Most of the time once the temperature has gotten below a pre-determined temperature the irrigation will not be shut off until the sun is up and starting to warm the vines. Fertilizing, for the most part, is accomplished by the use of granular type applications, which are applied with a boom. The cranberry boom is pulled behind a tractor or driven when mounted to a large truck frame. Most upland, newer cranberry beds are 150 feet across or close to that. The cranberry-fertilizing boom is pulled behind and is long enough to extend out to the middle of the cranberry bed. Small granules are sent out through numerous tubes that blow high velocity air down them causing the granuals to spread evenly as the boom moves slowly down the dike parallel with the bed. There are many pests that have to be dealt with on a typical cranberry marsh. Most medium to larger sized marshes contract with consultants who specifically scout for pests. Integrated Pest Management (IPM) scouts are trained too specifically use management practices to protect the Eco system and area wildlife. Bees are utilized in most of the modern cranberry marshes. The bees' help to spread the pollen to cause the pollination of more of the cranberry blossoms, which in turn usually, has a greater yield effect. Generally speaking the more hives per acre HPA the higher the yield potential. The average marsh that either rents or has their own bee hives uses 1 to 3 hives per acre. Weeding is not one of the favorite activities at most cranberry marshes. Because of the high organic content and granular fertilizer put on the vines and sand that the cranberries grow in there are usually a lot of freeloaders that tend to show up for a nice place to live and be spoon fed. Many marshes have problems with small trees. Willows and maples are very prevalent at southern and central Wisconsin marshes. Clover is also known for trying to establish a home within the cranberry vines. Many sedges are also abundant in damper ground. Initially weeds are a very big concern when the beds are in their first and second years. After the canopy develops the sun is shaded from the ground and one can no longer see any sand. At this point in time the vines themselves tend to have a major influence in keeping the weed population in check. Dikes are the roads around the cranberry beds. They are about 3 feet higher then the material, (sand) that the cranberry vines are growing in. The dike completely surrounds all of the cranberry beds. This is what holds the water in when flooding the vines for harvest, freezing protection, or winter flood. The dikes have grass growing on them for the prevention of erosion, and have to be mown. They also produce some weeds that will tend to go to seed if not kept at a reasonable height. 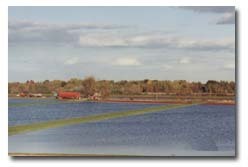 The dikes are also what the cranberry boom drives down to fertilize the cranberries as well as for the application of pesticides and herbicides as well as almost all maintenance activities. Harvest frequently tests how well a grower has maintained their equipment. Tractors, beaters ATV's bog boom berry pumps, harvest machines etc all have to be tuned and made ready. Fresh fruit harvest has different equipment. Not to mention the numerous pears of wader boots that the harvest help wear during the harvest process itself. Harvest is done slightly different dependent on the area of the country the marsh is in. The description of most of the marsh activities is based primarily on a Wisconsin marsh. Wisconsin produced 52 % of all of the cranberries produced in the United States last year. Harvest bog boom is basically a boom that was developed for Oil spills by the petroleum industry. This material has a cable in it and a chain that are floating on top of the water during harvest. The material goes clear across the cranberry bed and usually plenty of slack is left in it about 300 feet are in the water at any given time on a 150 foot wide cranberry bed. The strong floating material designed to pull in oil slicks where oil spills took place works great for pulling the floating berries down to the end of the bed during harvest. When you see pictures of cranberries being harvested the bog boom is what keeps the berries corralled More detail on cranberry harvest. The marsh owner as well as the surrounding communities welcomes the cranberry harvest. The largest cranberry festival in the world is held in Warrens Wisconsin during the harvest season. First the irrigation lines have to be removed from the cranberry beds. Most of the time they have been used a lot because this is also a time where frost protection is a common event in the fall. 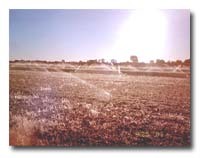 After the irrigation is removed or during the removal process of the irrigation lines the harvest flood is started. After the floodwater is close to rising over the top of the vines the beater tractor beats the fruit with reels that spin down into the water. As this separates the fruit from the vine the cranberries being air filled float to the top. The bog boom which floats on top of the water and has a cable in a skirt which goes about 5 inches under water form a moving pouch all the way across the cranberry bed. Tens of thousands of pounds of cranberries are pulled slowly down to the end of the bed. This is accomplished by a tractor pulling on each side of the bed slowly pulling the cranberries as the boom moves towards the end. After the berries are all rounded up the boom is now encircling the cranberries that are floating and up to several inches in depth. 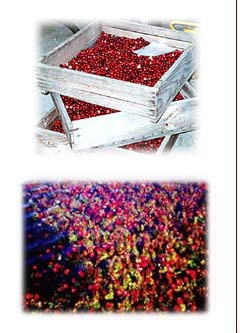 Different types of harvest machines are currently being used for elevating the cranberries from the water and a first cleaning as well as depositing them into an open topped semi or tandem dump truck. The most used type of harvest machine in this area is referred to as a berry pump. It's basically a pump that was designed to move small fish from one pond or lake to another without injuring them. It works quite well for transferring the cranberries from the water into the waiting semi. After the berries are removed from the bed the bed debris is cleaned off which is usually floating at one end brought down by the wind. The water is then allowed to flow out of the bed and the vines will soon turn to a burgundy color. Cranberry plants are perennial and the same leaves you see go dormant that turn burgundy are the same leaves you will see the next summer turning green. 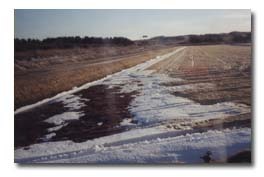 At this point in time wooden lath boards are put into the beds marking the ditches and or any other items that will be under the winter ice that may be a hazard for a 60 thousand-pound dumptruck to drive over. Mainly for marking the ditches surrounding the entire edge of the cranberry bed. This approximately one foot wide ditch is used as a drainage ditch inside of the cranberry bed. Winter flood is the term describing the usual latest flood intended to make ice for protection of the cranberry vines over the winter. It is very important not to flood to soon as the vines are still alive and continue to be oxygen dependent. It's important that the unfrozen part of the ice (the water below) is not left on the beds for longer than seven to ten days. Some growers monitor oxygen levels and will leave the water on for longer periods of time. As the ice freezes down closer to the ground the plants deplete the available oxygen even faster. It's a delicate balancing act. After the time determined to be appropriate has arrived the bulk head boards have to be taken out, usually frozen in the ice they frequently have to be removed with a chain saw or broken with a hammer. It's important to let the unfrozen water out. It could potentially damage or kill some of the vines if the oxygen content of the water has been depleted. Sanding of cranberry beds is a very good horticultural activity. The process involves driving usually tandem dumptrucks onto the frozen beds with 8 t0 10 inches of ice. The objective is to pour sand out of the back of the trucks while driving on the ice covering the cranberry beds. Most growers prefer about � inch in thickness. This is accomplished by a roller system attached to the back of the dump trucks. The sand is also most often screened. Screening takes the ice chunks and rocks out of the sand so that the roller system is not compromised. By sanding the vines, new growth, will fill in and the upright count will dramatically increase over just nature itself. Most people know how strawberries send out runners. Cranberries are very much like this. Runners do not produce very much fruit at all if any. They are more vegitative in nature not reproductive. The uprights however when covered with sand do produce what are referred to as uprights. Uprights are where budding takes place. This is where blossoms are formed and the fruit of the cranberry plant is produced. Basically things that grow in a horizontal plain in a cranberry bed are not helping to produce more fruit as a general rule. To a point they can actually rob nutrients from the reproductive portions of the cranberry plant. Pruning will be brought up later for to many horizontal runners. Sanding of beds is also of great value as far as from an IPM scout point of view. Integrated Pest Management consultants agree that when some of the cranberry enemies, bugs, lay eggs for the next summers hatch sand may stop a percentage of them from hatching if they become buried. Equipment maintenance is very important. Most cranberry equipment involves the use of hydraulic equipment. 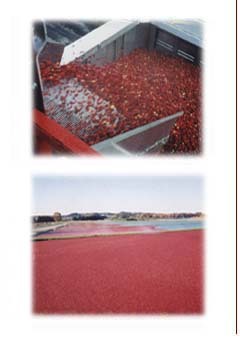 Almost all equipment that enters a cranberry bed utilizes vegetable oil synthesized hydraulic oil. This product is very expensive compared to regular hydraulic fluid. The main purpose for this is in case of an accident, leak or spill, the contents of the hydraulic lines and motor are edible. 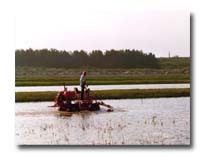 Cranberry marshes have a long history of taking care of the environment and protecting the quality of the product they produce. The cranberry marsh activity almost always slows way down in the winter. This gives the marsh employees and owner a chance to catch up on equipment maintenance. Marsh owners are very careful not to allow oil leaks or problems that occur that have the potential to compromise the crop or vines as well as ground water. Marshes are so totally dependent on enormous amounts of water. They consider themselves stewards of the water and find it very important to treat this natural resource with a great deal of respect. Water is a must and it must be taken care of. Pictured above is a pile of sand which is mounded up high in preparation for winter sanding. The ground will freeze the top four to five feet of sand and will render it unusable. That is why the pile has to be very large.